Aaliyah C. counted on her fingers, making sure the syllables added up. That was the breakdown she needed, as she tried different combinations of words. Leaning on the table, amidst her teammates with the clock ticking, Aaliyah had the concentration of a test taker. 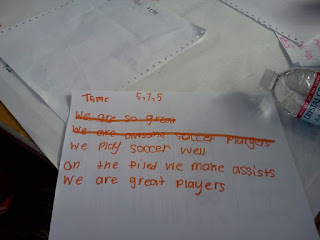 She strove to complete this haiku for Davis' Team Awesome in its competition against the Super Team. Success! Aaliyah felt a great sense of accomplishment with the completion of her first ever haiku. The volunteers from 826DC could be thanked for this. There aren't too many haiku contests out there for DC youth. "It's awesome," Aaliyah said. "I got to learn how to make a sentence of five (syllables), a sentence of seven, and then another one of five." 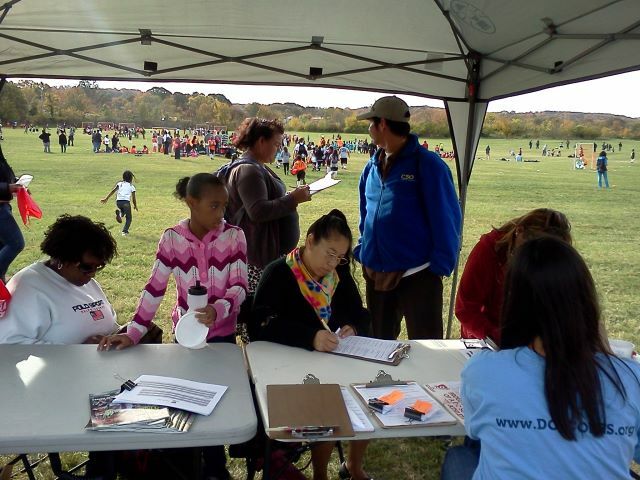 That was just one lesson learned by over 800 elementary school students during the 15th Annual DC SCORES Fall Frenzy Saturday at Anacostia Park. 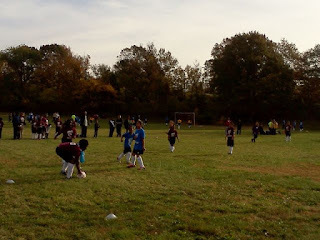 Hundreds of parents and community partners also came out to see their children play in soccer games; get their faces painted; run relay races; practice their shooting accuracy; and a lot more. At the northernmost part of the grassy expanse, DJ RBI spun jams throughout the day, which kept participants' energy level high and also led to plenty of dancing. To RBI's right, hundreds of parents stopped by a tent where they filled out surveys about their children's experience in DC SCORES. Toward the end of the day, names were drawn and an extremely excited mother won a raffle for a game console donated by The Century Council. To the right of the tent, a large goal was set up with target-practice patches strung to it — "30," "40," "50." DC SCORES partner Penya Barcelonista ran a shooting accuracy contest for each team that came through. When it was Thomson Elementary's turn, coaches Pharis Owens and Popsie Lewis provided more incentive for their students by placing their faces right up against the targets. Talk about living dangerously! Adjacent to the Penya shooting station, students engaged in a relay race you've probably never seen before. Each student had to carry a soccer ball on a cone to a volunteer, who held up a flashcard with a word on it. The student then had to say a word that rhymed with the written word before turning around and carrying the ball to the next student in line. When a Tubman Elementary student saw "Mellow" on the card, they didn't need any time to think. A few hundred feet behind the Penya station to the south, the soccer fields were spread out across a wide area of grass. During every 25-minute period, nine games were ongoing. First, the girls would play, followed by the boys. Every school played a handful of games, many of them against schools they had never seen before. Afterward, a Davis Elementary School student — his faced painted half black, half white — beamed as he told me about his first goal ever scored in a DC SCORES uniform. His moment was one of dozens experienced by the nine elementary schools participating in the event for the first time. To the northeast of the soccer fields, several tables and tents were set up and surrounded by hordes of students taking a break from the soccer action. At two of the tables, volunteers painted designs, school names, favorite numbers and more on the faces and arms of students who had plenty of Halloween spirit. After getting their tattoos, students topped by The Century Council table where they picked up soccer bags and filled them with free books, sunglasses and more giveaways from our awesome partner. Then they took all their free stuff to the 826 tent for some haiku writing followed by a stop at the Starbucks tent for arts and crafts activities. After all that, students took a break from activity at the lunch area and did a little dancing to the beats of DJ RBI before heading back out to the soccer fields. 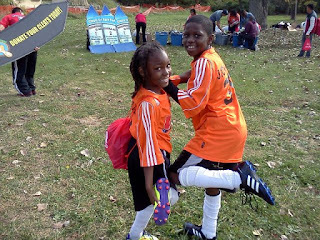 Thanks to a very generous donation from greeNEWit, hundreds of kids who arrived at the Frenzy wearing high tops for their soccer shoes left the event sporting used soccer cleats. They couldn't have been happier with a bag full of Halloween candy. They also walked away with Modell's Sporting Goods water bottles and bags thanks to a donation from our partner. And any injuries sustained during the long day of exercise were healed thanks to the medical expertise and soothing powers of Sport and Spine Rehab trainers. There was no better indication of how enjoyable the event was than the number of volunteers who showed up throughout the day. Whether they were painting faces, refereeing games, serving lunch or picking up trash, volunteers made the Fall Frenzy run smoothly from start to finish. Several of the volunteers were either DC SCORES alumni — eager to give back to the program — or middle school participants who also wanted to make the day special for the elementary school students. These students' eagerness to contribute to the day demonstrated their love for the program and desire to stay connected to it.